DDL describes a bunch of commands that CREATE Data Structures, like Tables, Views, and Procedures. 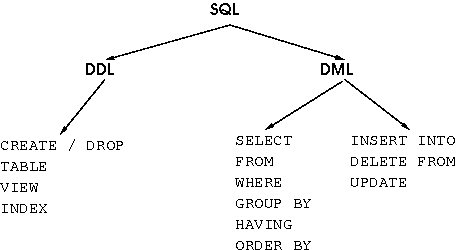 DML describes the commands that SELECT, INSERT, UPDATE or DELETE data to and from these Data Structures. DDL statements are used to build and modify the structure of your tables and other objects in the database. When you execute a DDL statement, it takes effect immediately. The ALTER TABLE statement may be used (as you have seen) specifying the primary/foreign key constraints, then you can do other modifications to the table structure. Key constraints may also be specified in the CREATE TABLE statement. The foreign key constraint is a bit more complicated since we have to specify both the FK attributes in this (child) table, and the PK attributes that they link to the parent table. If you totally mess things up and want to start over, you can always get rid of any object you have created with a DROP statement. The syntax is different for tables and constraints. DML statements are used to work with the data in tables. You have already seen the SELECT statement, it is considered to be part of DML even though it just retrieves data rather than modifying it. The UPDATE statement is used to change values that are already in a table. The DELETE statement does just that, for rows in a table. You will find more fundamentals in my Previous Posts! This post is an introduction to DDL and DML concepts. We’ll see more about these statements in the next episodes!